Last week we heard from artist and COASST intern Rose Beede about how she views and sketches seabirds. This week, we hear from another very talented COASST intern, Chelsea Starr. We are so fortunate to have two very talented artist on the COASST team who each bring in their own unique perspective. As a biology enthusiast and COASST intern, and I often enjoy making study-type watercolors of different fascinating animals. 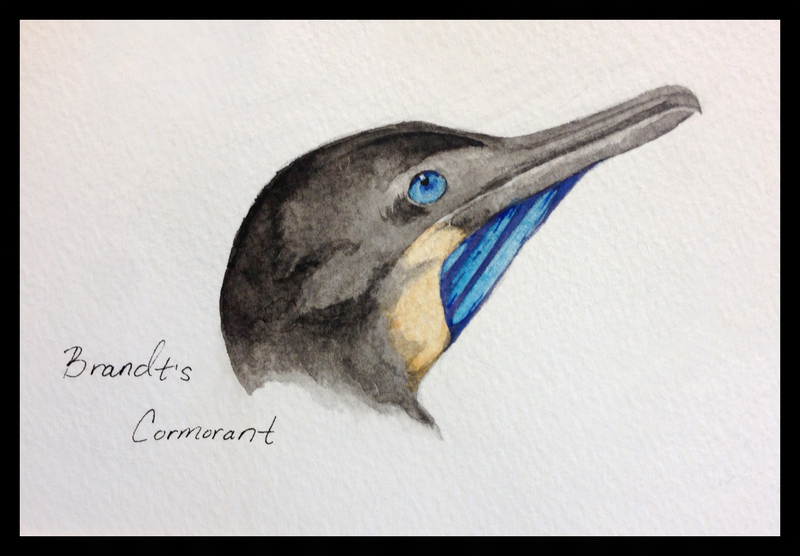 Recently, I decided to paint the Brandt’s Cormorant. Why you ask? I found the Brandt’s Cormorant (specifically the breeding birds) to be incredibly versatile visually with a very wonderful and dominant presence. Their casual posture reflects an aura of wisdom while the jet-black plumage nicely reflects their stoic and ruthless resolve for life. The Cormorant’s iridescent sapphire eyes and throat poach contrast with this serious demeanor in a whimsical way. They are dark and brilliant all at the same time. Lastly, the light whiskers on the sides of cheeks gives a much needed sense of humor to their appearance, especially when viewed from the right angle. When you add all of these observations together, you get a beautiful and visually complex seabird that can represent very powerful aspects of life that I consider very important…. Wisdom, Determination, Beauty, and Humor. This entry was posted in Uncategorized and tagged Art, Interns, Pouchbills, Seabird on May 29, 2013 by coasst. “And now for something completely different…” as Monty Python would say. What is it like to look at seabirds from an artist’s perspective? First of all I, the writer, would like to introduce myself. My name is Rose, and I’m one of the student interns here at COASST. I answer emails about seabirds, enter data about seabirds, and I draw seabirds. 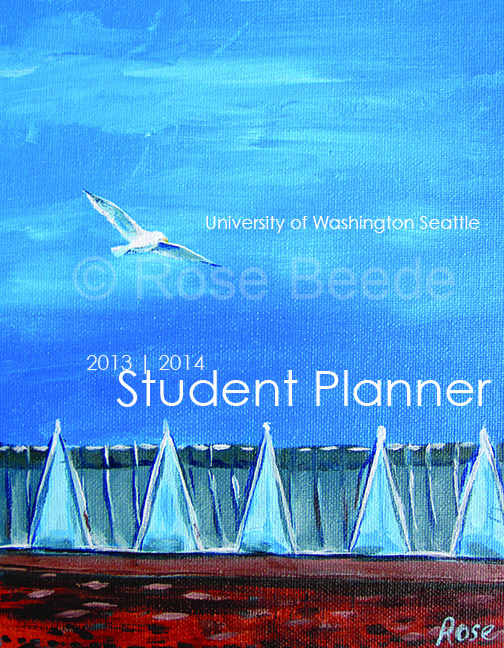 As an artist, I specialize in pets and wildlife, and do custom portraits and odd job commissions when I’m not too busy with school here at the University of Washington. 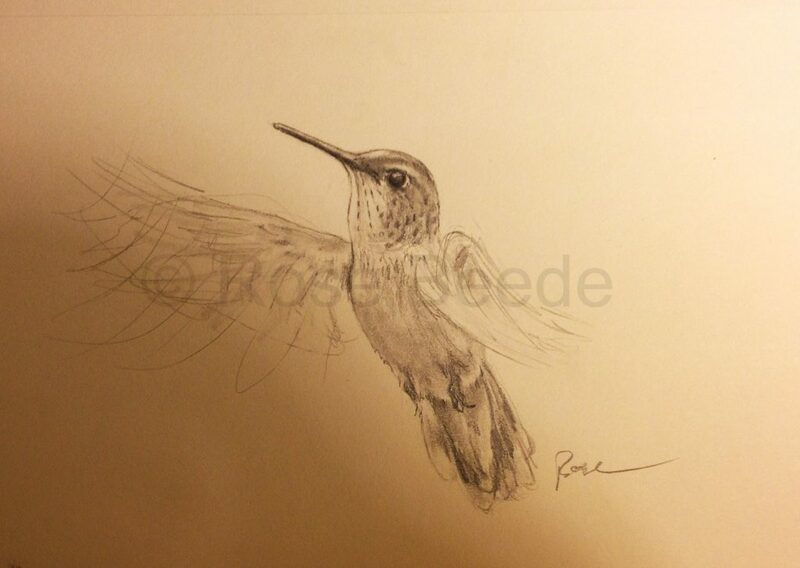 Of all the possible subjects, why would I draw birds? Birds have always been aesthetically fascinating to me. This fascination is a little bit hard to articulate, but I will try my best. There is a certain lightness to them that touches me, sort of like a gust of wind touches a leaf and lifts it for a moment. Very often gulls and turns gliding on a playful breeze will catch my imagination, and I will imagine myself as one of them dancing upon the wind. There is something so beautiful and sleek about the smooth curves of a streamlined bird that give me such deep satisfaction to emulate on paper. Seabirds are a supreme design. For a designer, it is extremely difficult to create an object that is both fully aesthetically pleasing and functional. If you think about all the objects you use in your daily life – your phone, or your vacuum cleaner – all these things are made up of compromises between beauty and functionality, yet in seabirds both are one and the same. In reality, at least for me, seabirds from and “artist’s perspective” and seabirds from a “scientist’s perspective” aren’t terribly different. Aesthetically beautiful wing curves can be described mathematically in terms of lift and airflow, which can then be analyzed statistically to determine fitness during winter months. Birds are fascinating to me. This is the reason I draw them, and it is also the reason I peer at them through binoculars, or trek out to the beach in the rain to log their carcasses. When you get down to it, I’m simply exploring what I love, with the skills that have been given to me. 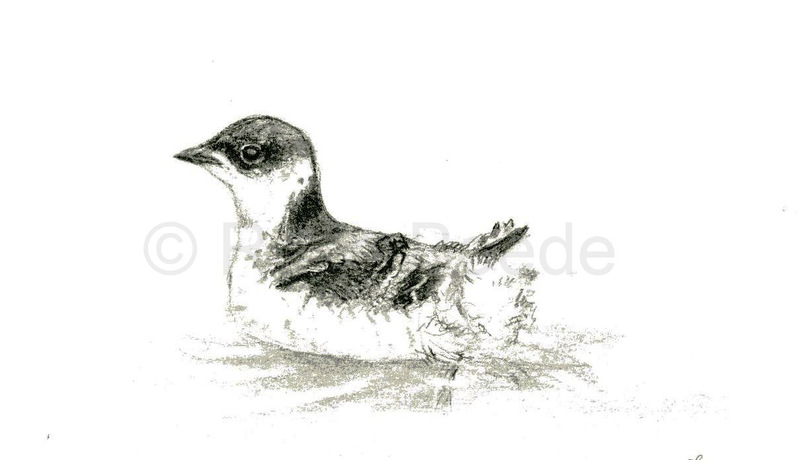 This entry was posted in Uncategorized and tagged Art, Interns, Seabird on May 23, 2013 by coasst. A cool exhibit about sea life and the threat of ocean pollution opened on March 23 at the Harbortown Event Center in Bandon, Oregon, located at 324 Second St. SE in Old Town Bandon. The Washed Ashore exhibit is an internationally famous touring exhibit that has appeared at many venues in Oregon and California, including the Oregon Coast Aquarium, The Marine Mammal Center in Sausalito, Calif., The Living Coast Discovery Center in Chula Vista, Calif., and the Newport Visual Arts Center in Oregon. Washed Ashore, an environmental education project, uses art and community involvement to communicate the dangers of marine debris to ocean life. Founded in 2010, Washed Ashore has collected more than eight tons of marine debris and is a founding member of the Oregon Marine Debris Team. In addition, Washed Ashore works closely with a number of organizations to address Japanese tsunami marine debris. The Washed Ashore exhibit is comprised of fifteen giant sculptures of marine organisms built from scavenged marine debris, and is the only art show utilizing marine debris in the nation. Local volunteers put together each sculpture, some of which are up to fifteen feet long, in community workshops led by Angela Hasltine Pozzi. Some of the sculptures featured in the exhibit are up to 15 feet tall. 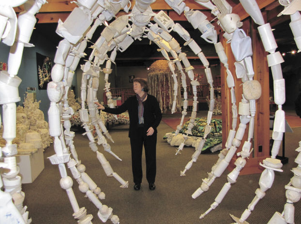 Since local volunteers make this project possible, citizens of Coos County are invited to help put together the next pieces for the exhibit, which include sea horses, penguins, a shark, and an octopus. In addition, Washed Ashore is always accepting donations of marine debris, and they can be dropped off at Art 101 just south of town. For more information, contact Frank Rocco, Washed Ashore development director, 415-847-1239 or FrankRocco@WashedAshore.org. This entry was posted in Uncategorized and tagged Art, Marine Debris, Oregon on April 11, 2013 by coasst. 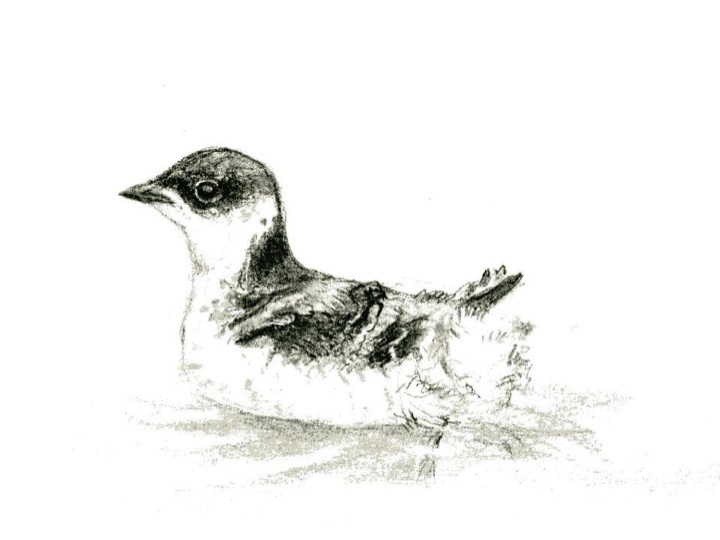 In light of the recent Marbled Murrelet news, we thought that we should post this amazing drawing by Rose, a former COASST intern. Talk about talented!